[Jesus said,] "I can do nothing on my own. I judge as God tells me. 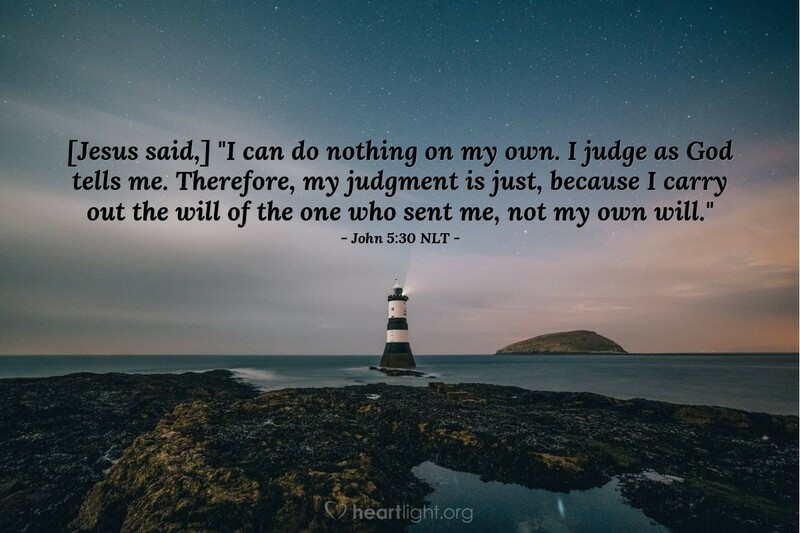 Therefore, my judgment is just, because I carry out the will of the one who sent me, not my own will." When businesses or key business leaders get in a bind or try to decide about strategic opportunities, they hire a consultant. They use a consultant to help them sort through the issues, avoid making careless mistakes, and make the best decisions. Jesus consistently used this same strategy in his ministry. However, Jesus used only one consultant, the Grand Consultant, his Father. Incredibly, Jesus taught us to use this same Consultant as well. So as you face tough decisions or questions about what you need to do, why not follow the example of your Savior? Spend time consistently with the Grand Consultant! Father, the all-wise and all-knowing Creator, please give me wisdom. I face decisions, and I need your help. I have opportunities placed before me, and I need your guidance. I have blind spots in my perception, and I need your truth. Help me know the way I am to go and the things I need to do to live victoriously and to honor you fully. In Jesus' name, I pray. Amen.